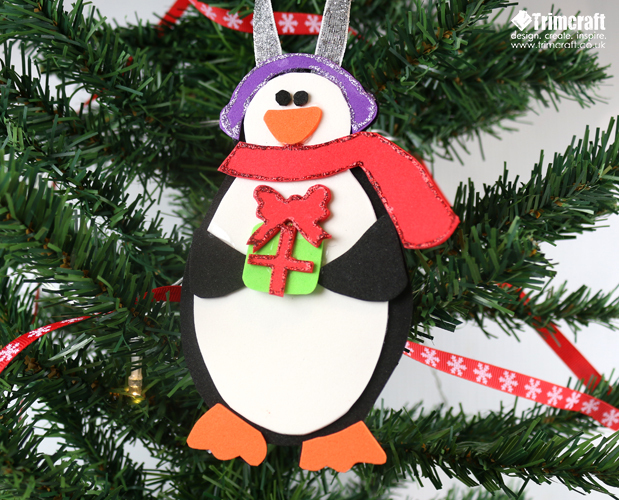 It’s time to pick up your penguin decoration template and get crafting with the kids! The little ones will love hanging their personalised penguin on the Christmas tree and this design is really easy to whip together with our free template. 1. Begin by printing off your free Christmas penguin decoration template and cutting out all of the elements. 2. Next, cut out each part of the template from your chosen Dovecraft A4 Colour Foam. 3. Before adhering the middle section to the base of your penguin, cut a length of Dovecraft ribbon, loop it and glue it to the base. 4. Securely glue the middle part of your penguin design to the base of your decoration. 5. Layer each piece of the coloured foam to the penguin, ensuring each piece is secure. 6. Finish by adding a line of Dovecraft Glitter Glue to your chosen sections to make your decoration really sparkle! Leave to dry. This adorable penguin decoration template will make a wonderful, festive project and the kids could create a whole family of penguins using different coloured foam!